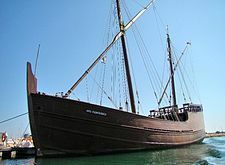 The caravel has origins in earlier Portuguese fishing boats built in the 13th century based on the medieval Islamic qarib, used in Islamic Spain. This was itself a legacy of the Byzantine καραβίς (pronounced 'caravis' in Byzantine Greek) that had ruled the Mediterranean before the advent of Islam (cf. Carabisians). 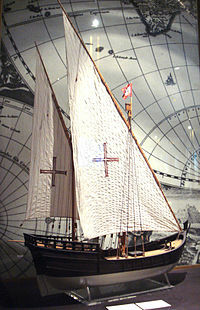 The caravel's lateen sail, which went back at least to Roman times, was widespread in the Mediterranean. This page was last edited on 23 April 2019, at 05:57 (UTC).